Who is sick of waking up to the same old coffee or tea day in and day out for that morning caffeine energy boost? How about a nice refreshing juice drink in the morning, with the benefits of natural caffeine from green coffee beans? Positive Energy juices boost physical energy, increases alertness and attention, improves memory function, and contains antioxidant properties. You can also get your daily fruit serving by drinking Positive Energy juices. Eating a diet rich in fruit and vegetables as part of an overall healthy diet may reduce risk for heart disease, including stroke and heart attack. Fruits are sources of potassium, dietary fiber, vitamin c, and folic acid. Eating a diet rich in some fruits and vegetables as part of a healthy diet may help reduce the risk of certain types of cancers. Vitamin C is important for repairing of body tissue, keeps teeth and gums healthy, and helps cuts and wounds heal. This product is happy to say it is non-GMO certified. There is no added artificial flavors, no preservatives, no guarana, and no taurine. One bottle of Positive Energy juice has the same amount of caffeine as a premium cup of coffee. 1. Lemonade Tea, from concentrate, 75 mg of caffeine per bottle. 2. Orange Juice, not from concentrate, with 150 mg of caffeine per bottle. 3. Strawberry Lemonade, from concentrate, with 75 mg of caffeine per bottle. 4. Cranberry Juice Cocktail, from concentrate, with 150 mg of caffeine per bottle. 5. Peach Mango Lemonade, from concentrate, with 75 mg of caffeine per bottle. 6. Apple Juice, from concentrate, with 150 mg of caffeine per bottle. 7. Lemonade, from concentrate, with 75 mg of caffeine per bottle. I can honestly say these were the most refreshing, tasty juices I have ever tried! I loved every flavor equally . They are great drinks to pair with a healthy breakfast to start the day off, or drink after a hard work out. 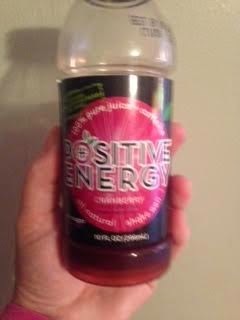 Anyone who is looking for a coffee alternative, or is looking for a more health conscious drink, please give Positive Energy juices a try, it is the most positive decision you can make!, you will not be sorry! 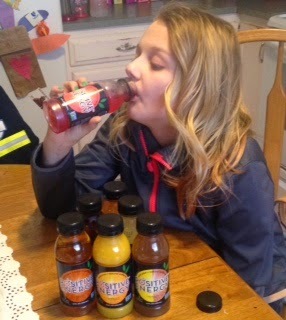 For more information, please visit their website at www.drinkpositiveenergy.com. Disclosure: Christine O. received complimentary samples of the product mentioned in this review. No monetary compensation was received and her opinions on the product are 100% her own and were not influenced by the company. Your opinions may differ. I am glad that these drinks were so refreshing and tasty. I am not sure about the amount of caffeine, especially the bottle that have 150 mg. of it.